Golfe du Morbihan-Vannes Agglomération gathers 34 towns and counts 170 000 inhabitants. It includes Vannes, the second city of the department in number of inhabitants. Largest urban area of Morbihan, it covers 807 km² and 423 km of coast; nautical territory par excellence. Communauté d’agglomération la plus étendue du Morbihan, elle s’étend sur 807 km² et 423 kms de côtes ; territoire nautique par excellence. This last sector is particularly dynamic whether for recreational or competition sailing. 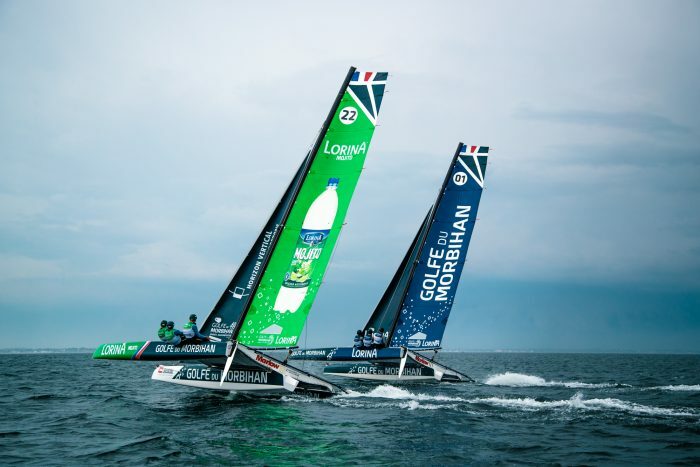 Major international operators such as Plasmor, Bic Sport, Multiplast, North Sails … were born or developed on Golfe du Morbihan-Vannes Agglomération. Numerous racing boats have been designed or manufactured in Vannes thanks to famous naval architects such as Finot-Conq and VPLP. In connection with the nautical ecosystem, Golfe du Morbihan-Vannes Agglomération leads a project of attractiveness and professionalization of young skippers of the territory, in partnership with the Geyer Frères establishments and their brand Lorina as part as a public/private partnership. Thus, the Lorina Golfe du Morbihan Team participates since 2016 in the “Tour de France à la Voile” and enjoys a beautiful record : a victory in professional in 2016, another in youth in 2017. The “Tour de France à la Voile” will also stop on July 15th, 2018 in Baden. Presentation of the yachting sector : key indicators, flagship companies, innovations, etc. Founded by Lowell North in San Francisco in 1957, North Sails is specialized in the manufacture of sails for racing and leisure boats, surf boards and wings for kite-surfs. Its research and development center is based in Vannes. Created in 1981, Multiplast specializes in composite and carbon materials for the civilian, military, aeronautics, space and competitive boat building industries. It designs and builds multihulls and monohulls in high-tech composite materials. VPLP Design is a world-renowned international team of designers and naval architects based in France, designing sailing and motor boats throughout the world for 30 years. This company designs and produces high-performance, innovative carbon composite parts for competitive sailing, motor racing, industry and aeronautics. The company has been renowned in the competitive sailing sector since 2002. This is a FREE guided tour ! Golfe du Morbihan-Vannes Agglomération staff will take care of everything ! After your registration, within a month before the tour, you will received an email with all practical details.